There are times in our lives where we decide that we want to be better, we realize we've gotten off track and have made mistakes and we want to change. Sometimes those changes are little and sometimes they are so big that it changes our entire lifestyle. About a month ago I was getting ready on a Saturday morning and listening to CMT when I heard the new Rascal Flatts song “Changed” come on. The lyrics just hit me and I stopped what I was doing, planted myself in front of the television to watch and listen to the video. There were lots of different thoughts running through my head, but the one thing that stuck out was just how amazing it was to hear such a well-known artist singing a really inspiring song. I know the song can mean many things to many people, but hearing the lyrics it meant a lot to me. I remember the moments, yes moments, in my life where I realized I needed to get on my knees and change. 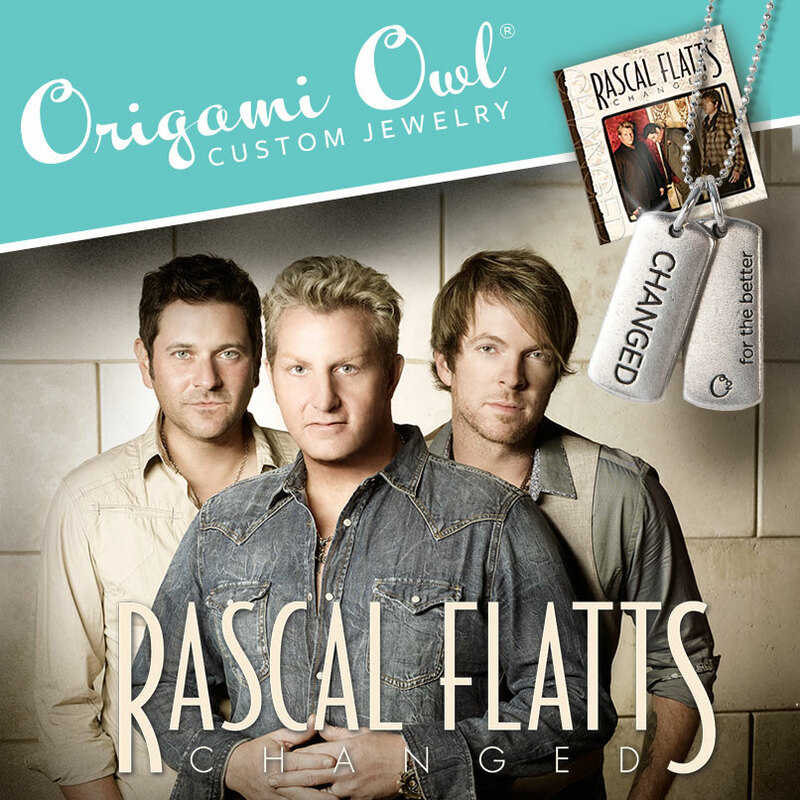 This week I found out that Origami Owl is joining forces with country music legend Rascal Flatts to inspire a movement of change across the country. Rascal Flatts hit single Changed highlights a spiritual revelation that results in a life changed for the better. They want to inspire people to make a change for the better in their own lives and in the lives of others. Whether it be spiritual, health, lifestyle or otherwise, they hope you will join them on this journey. If you could do just one thing to change your life for the better, what would it be? + Spend more time with family? + Be a better friend? + Live a healthier lifestyle? + Improve the quality of your life in some other meaningful way? Live a life of purpose! Celebrate your decision to change with a limited edition Changed Tag. Wear your Origami Owl Changed Tag proudly as a message of inspiration, encouragement, and hope for what the future holds or gift it to someone who needs to know you support and encourage their change. 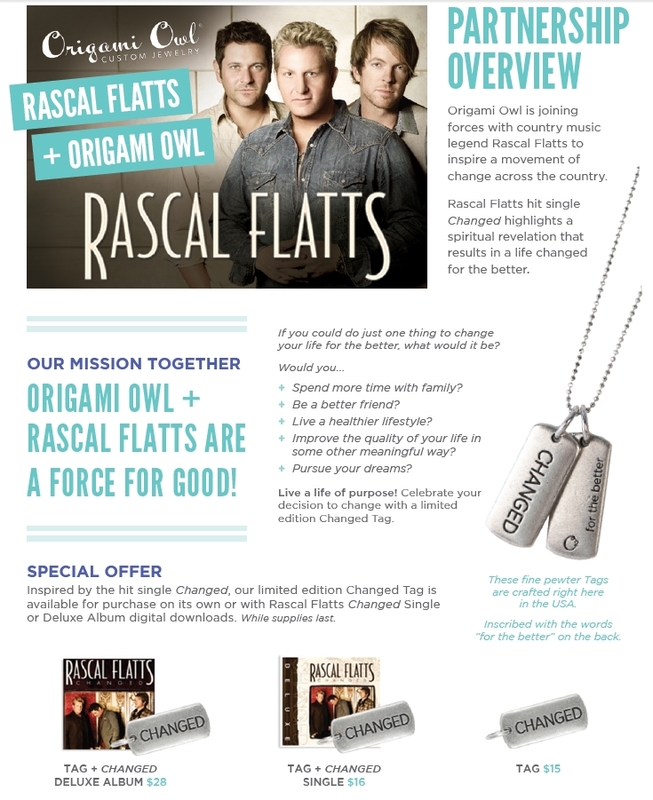 Inspired by the hit single Changed, the limited edition Changed Tag is available for purchase on its own or with Rascal Flatts Changed Single or Deluxe Album digital downloads. While supplies last. To you get your limited edition Changed Tag please visit here. Ok lovelies, I’m off to order my Changed Tag now for myself and for a few others I know who have recently made a change that I want to support and encourage. Will you do the same? Let’s be the inspiration….lets be the change.